How many times has someone told you that you looked tired? Do you find yourself yawning in class or when hanging out with your friends? You may not be getting the 8½ to 9½ recommended hours of sleep. Don’t worry; you are not alone. According to the National Sleep Foundation only 15% of teens get 8½ hours of sleep on a school night. This is not always possible because of teens’ busy schedules. Sports practice can go well into the evening, not to mention hours of homework and studying in addition to household responsibilities. IHA sophomore Hannah Gunning believes the lack of sleep “is because a lot of girls have clubs [they attend] because they want to get ready to apply to college. I know my one friend plays volleyball and goes to bed at 1 in the morning. It is definitely harder for girls who play sports and are in honors.” Often, teens stay up until the wee hours of the morning only to be awakened a few hours later in order to catch the bus. They try to “regain” their sleep on the weekends, but that disrupts their sleep patterns. Some teens’ lack of sleep is not simply a problem with scheduling; they are suffering with legitimate disorders such as sleep apnea, restless leg syndrome, insomnia, and delayed sleep disorder. All of these either affects how the teen falls asleep, how long they stay asleep, or the quality of the sleep received. Sometimes getting a bad night’s sleep is worse than no sleep at all. Not getting enough shut-eye leads to many problems. Teens become less focused and more irritable. They don’t understand concepts and get confused and distracted easily, leading to a drop in grades. A little thing such as a bad mark can set them off, making them lash out at friends, teachers, and family members. Teens also become more prone to illness, over-eating, and getting pimples. As simple as the solution to these problems seem, it is not so clear-cut. Most teens find it hard to fall asleep because during adolescence, the body’s circadian rhythm (an internal biological clock) is reset and it tells the teen to go to bed and wake up later. Melatonin, a hormone that helps regulate the sleep cycle, is created later in the day than in children and adults. Therefore no matter how early they go to bed, teens will still have sleep issues. Despite the sleep issues teens face, they can still help themselves with sleeping better. Having better time management skills and knowing when to stop working is a good start. 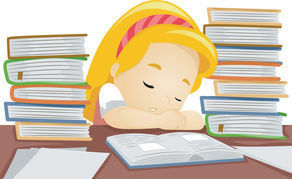 Staying up late studying is often times more detrimental than beneficial. It is best to not do any stimulating activities before bed such as exercise, listening to exhilarating music, watching thrilling television, and surfing the Internet or checking social media. If you want to use a device before bed make sure that the brightness is low and do not keep it too close to your face. Another suggestion that can help sleep is eliminating caffeine, especially too close to bedtime. A little caffeine now and then can help you focus but a consistent intake will be harmful. Caffeine is a stimulant and will keep you up until all hours of the night. Unfortunately, it does not seem that the busy schedules will lighten up soon and teens can do nothing about their naturally produced melatonin. The only thing they can do is try to relax before they actually go to bed and not drink too much caffeine. Hopefully, teens’ bodies will be able to get used to their sleep cycle so they can get enough sleep and not doze off in class.